Look for hummingbirds on the slopes of Pichincha Volcano. Hike to waterfalls amid the lush cloud forest of the Mindo-Nambillo Reserve and visit a butterfly farm. Spend two nights at a delightful hacienda in the Avenue of the Volcanoes. Visit the Equatorial monument, and have your picture taken with one foot in the southern hemisphere and one foot in the northern hemisphere. Spend a day in the spectacular highlands at the base of Chimborazo Volcano, viewing troops of vicunas. Discover the color and excitement of a traditional highland market. And explore the amazing colonial treasures of Quito, a UNESCO World Heritage Site. This Ecuador tour works well as a base to build a longer custom itinerary. 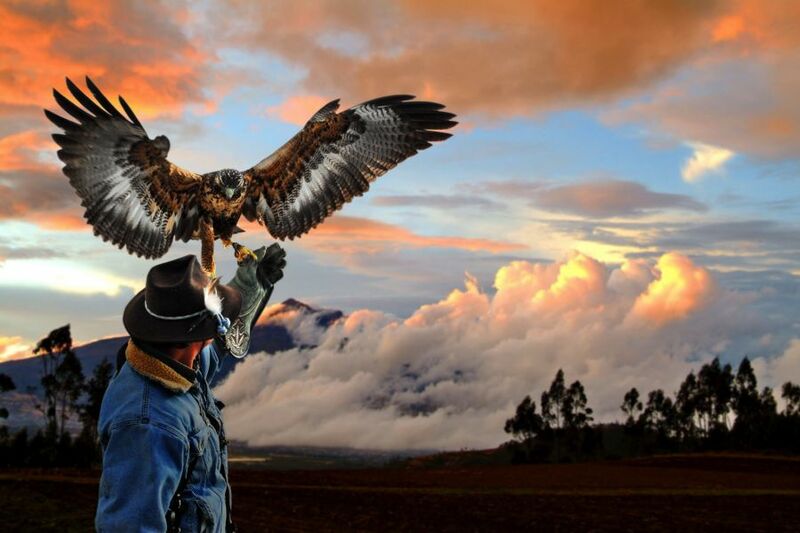 We can add on Hacienda Cusin and visit Otavalo market in the north or Cuenca in the south, an Amazon lodge visit, and of course the Galapagos Islands! We meet you as you arrive into Quito airport, and transfer to a comfortable hotel for overnight. Quito is at 9,350', on the eastern flank of the twin volcanoes Rucu Pichincha and Guagua Pichincha (15,725'). We depart bright and early, leaving the city behind and driving up into the moorlands on the northern slope of Pichincha Volcano. We're following the El Quinde Ecoroute, the so-called Route of the Hummingbird. Within half an hour our surroundings are transformed from urban streets into the lush greenery of the Ecuadorean highlands. We stop to look for hummingbirds in the high pasture, then continue down past the quaint village of El Nono. Soon the fields and pastures are replaced by the steep mountainsides and cloud forest of the Mindo-Nambillo Reserve as we descend alongside a rushing river. In mid-afternoon we emerge at the main highway and soon reach our country inn just outside the town of Mindo at 4,200'. We include lunch and dinner. We spend the morning hiking on trails in the lush forest of the private reserve surrounding our country inn. We'll view waterfalls, many birds, and an exotic forest full of epiphytes. We return to Sachatamia for lunch, then drive down into Mindo town to visit the Mariposarium, a butterfly farm. In the afternoon you have time for optional activities -- tubing, rafting, zipline, or more nature observation in the forest. We return toward Quito following the main paved highway, to Calacali and the Solar Museum. Located almost exactly on the Equatorial line, the Solar Museum is a small, privately-owned institution with fascinating exhibits on the indigenous awareness of the Equator. We continue south, bypassing Quito, and reach our lovely highland hacienda (Hacienda Hato Verde or similar) where we settle in for a two-night stay. We include lunch and dinner. We visit a native market in the Avenue of the Vocanoes. On market day, indigenous highland farmers congregate to buy and sell, to get haircuts and baptisms, and to socialize. These traditional markets continue to be an integral social foundation for the regional community. Following the market, we climb steadily toward massive Chimborazo Volcano (20,696'). Above the level of the highest pasture, we traverse the "despoblado", the vast slopes of volcanic ash and sand. Part of this highland country is a Chimborazo Fauna Reserve, where we may view troops of the elegant vicuna grazing near the highway. We continue our circuit of the mountain, and descend back down into the Avenue of the Volcanoes at Riobamba. From here we turn north and return to the hacienda for overnight. We include lunch and dinner. We depart the countryside, returning in the morning to Quito. After settling into our hotel, we enjoy an afternoon tour of the colonial heart of Quito. We visit the Plaza de Independencia, the church of La Compañia, and the San Francisco Plaza. You also have time for some shopping. Lunch is on your own; farewell dinner tonight at the Itchimbia Park. We transfer you to the airport for your flight home or onward travels. Itinerary is offered year-round. Rates available upon request.